His Majesty King Abdullah II on Monday joined Saudi King Salman bin Abdulaziz and a number of leaders and heads of state of Arab and world countries at the closing ceremony of the joint military exercise “Gulf Shield 1” in a military field in eastern Saudi Arabia, Petra news agency reported. The last day of the drill included a military parade by the participating forces and a mock live-fire counter-attack by fighter jets, attack helicopters and mechanized military forces in which columns of thick smoke rose from the scene after air strikes and heavy machine gun and tank fire. After the hostile forces occupied a village, they were encountered with air strikes in urban areas, and the site was mopped up by Special Forces. The war games also featured a potential naval attack and cyber piracy, which were encountered by marine forces, gunboats, sea landings and coastal defenses in an operation that proceeded with an infantry advance. It ended with a parachute landing of the Special Forces that simultaneously went with the military column’s parade and the entry of the flags of the participating countries and the participants' parade before the podium, which was followed by a display of modern machinery that showed the capabilities of various land, air and marine forces in terms of armament. An air show by fighter jets of various types began later. The closing ceremony was attended along with His Majesty the King by Chairman of the Joint Chiefs-of-Staff, Major General Mahmoud Freihat, the King’s Advisor and Director of the King’s office. The “Gulf Shield 1” was held over a month in the Eastern region of Saudi Arabia, with the participation of units from the Jordan Armed Forces and military forces from 24 Arab and friendly countries. It aimed to increase the preparedness of the participating nations, update machinery and joint measures of the security and military services, enhance joint military and security coordination and integration and demonstrate the combat readiness and capabilities of the participating armies. The exercise is one of the largest war games in the region in terms of numbers of participants and up-to-date military equipment and the use of combat capabilities according to the latest military expertise and tactics. 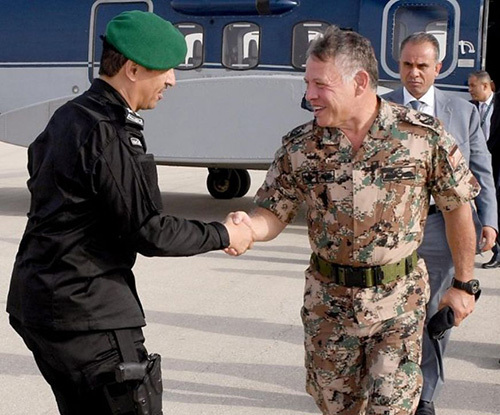 The Jordan Armed Forces-Arab Army took part in the Gulf Shield 1 exercise, as it contributes to raising the readiness of its units and formations in order to acquire expertise from the participating armies.